Elinchrom Lights Need a New Home. Too Crowded in Their Current Environment. Swiss Flash, Cheap. I was out impulse shopping last week and came across a set of lights in a case that I couldn't pass up for the price. It was a lightly used set of Photogenic Powerlight 1250 DR's (monolights) , complete with brand new, medium sized Photoflex Platinum soft boxes, Chimera quick release speed rings and an almost new, Kata large rolling case. Turn key for about $600. I brought them home, played with them. Liked them and decided that having two different sets of monolights is NOT downsizing. One set has to go. Since I'm still in the honeymoon period with the Photogenics it looks like I'm breaking up with the Elinchrom monolights. I sold off my Profoto strobes to buy four Elinchrom D-Lites because I was also using an Elinchrom Ranger RX AS power pack and heads and they all shared the same reflectors and other accessories. This model, the Elinchrom D-Lite4 it has a lot of great features. First of all, each one of these is about 1/3 the weight of my older, power equivalent Profoto monolights. The interface on the back is digital and the lights have built in thermal protection and cooling fans. The D-Lite 4 it is a 400 watt second unit with a recycling time of around 1.6 seconds at full power and a full power flash time of 1/800th. You can use the digital controls on the back to change the power settings from full down to some small minimum in 1/10th stop increments. You can ratio the modeling light, use it on full or turn it off altogether. I bought all four of my Elinchrom D-Lite 4 it flashes back in June or July of 2011 but they came at a time when I was omitted with LEDs and then fluorescent lights so they haven't seen the daily, hard work they would have had they arrived on my scene back in the earlier days. All four work well, haven't been dropped and aren't beaten up. They come with a protective front cap made of some space age polycarbonate. They come with a 100 watt modeling light and a sync cord. They have a built in optical slave but, unlike the model replacing them now, they don't have built in radio slaves. I am hoping to sell them to someone who needs a good set of lights and who lives somewhere within 100 miles of Austin but if that doesn't happen I'll be happy to sell them and ship them anywhere in the Continental U.S.A. I'm asking $125 for each one. Buy all four and you can have them for $400. Since I don't offer Kirk Prime there will also be a packing and shipping charge of $15 per light or $25 for all four lights shipped to the same address. If you are interested send me along your queries via the moderated comments on this blog. I won't post your comments if they are about the purchase of these units but will use it to get in touch with you so be sure to leave me an e-mail address to respond to. Help me downsize yet again! Edit: August 10th. Thank you! The lights have been sold. Reader, Ken, helps me open a new bag of worms. "Do I miss the GH4?" Do I feel I have the right tools for the job? (worms no longer come in cans....). August. Every day over 100(f). 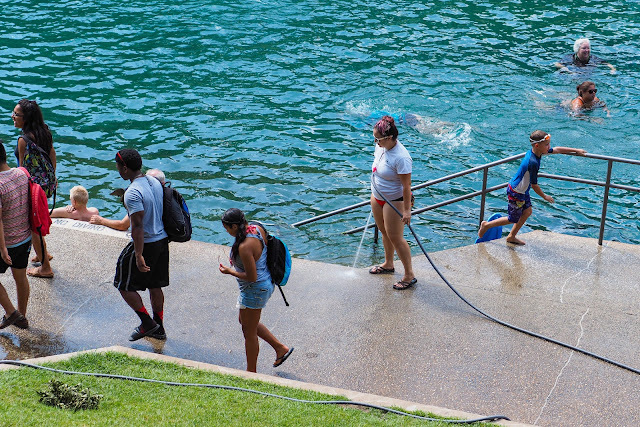 This is the month to spend time at Barton Springs. Everything seems to move so fast for photographers and videographers and yet everything seems to move glacially slowly for client adaptation. Get photographers or videographers together and many times the subject of conversation circles around to the latest technologies; and is accompanied with the implicit understanding that we must continually upgrade to the latest stuff just to survive in some sort of ultra-Darwinian marketplace (wrong assumption, IMHO). I'm a part-time victim of that process. I buy into the excitement and fear of tech advances and then I rationalize my way back out again. I sing the praises of the Nikon D810 and then do a wonderful job on a project with the tiny Olympus cameras. In the end it helps that I am married to an award winning, and very wise, graphic designer. She is currently working in a large, good ad agency in Austin, Texas. She is part of a team working on national and international ads. Her point of view on gear and camera tech? : Nobody in Advertising Cares as Long as the Image Looks Great. And when she says, "Looks Great." she is never talking about resolution or even dynamic range but always about: gesture, pose, expression, color design, composition, propping, styling and timing. People who work with images everyday in their jobs and are responsible for knowing how things will print and how they will look on posters, or brochures, or as tiny web snippets, have long known, or sensed, that our cameras hit the point of sufficiency years ago. They laugh at us for worrying about the difference between 16 pixels and 18 pixels or 24 pixels. Doesn't matter as long as the image looks great. Let me explain the term: sufficiency.